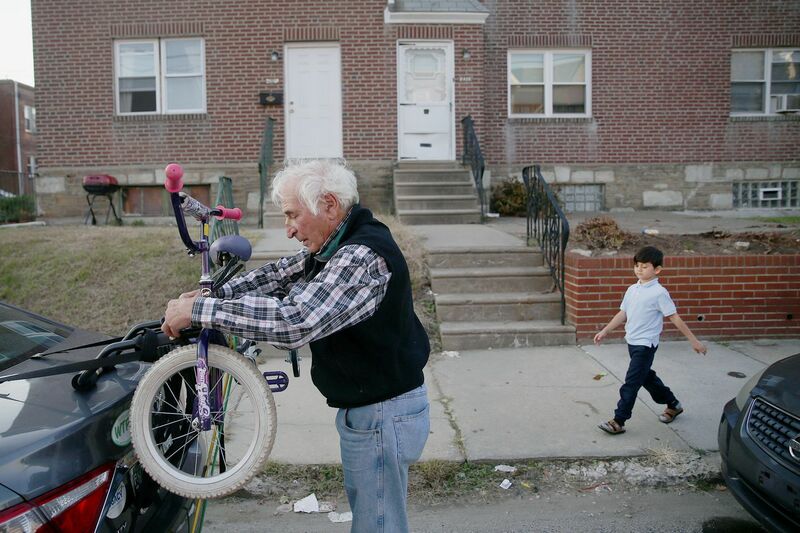 HIAS PA volunteer David Broida brings a bicycle for Ebrahim, an 8-year-old from Afghanistan, to the boy’s Northeast Philadelphia home. The phone kept ringing Monday at the Philadelphia headquarters of HIAS, and the question from the refugees that this storied agency serves was almost always the same: Am I safe to come in? The calls surged in the wake of Saturday's shootings at a synagogue in Pittsburgh, where a man, fueled by anti-Semitic hate, killed 11 worshipers and wounded six other people, including four police officers. In social media ravings, Robert Bowers reportedly expressed anger at HIAS. He repeated dangerous, increasingly prominent lies that suggested Jews were funding a migrant caravan headed toward the country's southern border. And so the phone kept ringing at HIAS PA, the Jewish-founded refugee resettlement agency that for more than a century has helped find homes for people fleeing some of the most dangerous places in the world. It has been this way for two years, really, with this president and his nationalism. "Our clients are hysterical, nervous, scared and upset," said Cathryn Miller-Wilson, HIAS PA's executive director. "They've never felt so unwelcome." In this environment, HIAS PA is now juggling combating falsehoods and dealing with the trauma of shootings with its everyday work of trying to help refugees settle into new lives. "It's enormously frustrating," Miller-Wilson said. "We spend all day responding to myths that by themselves would take us away from being able to help clients." HIAS Pennsylvania Executive Director Cathryn Miller-Wilson stands for a portrait in her office in Philadelphia. HIAS PA and its Philadelphia staff resettled just under 100 refugees this year — its client list has shrunk from an average of 200 to 250 since Trump took office. They help families through their first steps in a new country, finding housing, furniture, work, schooling, and assistance. They do so with a cadre of trained volunteers such as health-care navigators who help families get medical assistance; "Philly neighbors" who sponsor refugee families; and all-purpose volunteers such as David Broida, a retired parks and recreation director from Bryn Mawr. Miller-Wilson him calls a "one-man Giving Tree," collecting all manner of donations for clients. Broida makes weekly rounds through Northeast Philadelphia, delivering donated items — the sorts of things that help families thrive, such as cell phones and laptops, bicycles to get to work and school, and rugs and rice cookers for newly purchased homes. His work is the essence of HIAS PA's mission, anchored in the Torah: They help strangers because they, too, once were strangers. Broida's in-laws fled Nazi-controlled Austria in 1940. Other relatives didn't make it out. His extended family is from Pittsburgh, and so the shooting hit close to home. He never thought he'd see a world where HIAS was targeted for its basic mission. "I like to think we're going to leave the country in better shape for our children," he said. "Up until a year or two ago, I never had doubts. Now the hatred, the press as 'enemies of the people,' the stuff on social media — it's abhorrent. This is just beyond my imagination. This isn't my country." But as Broida tries to welcome HIAS PA clients, he is staking his own claim here: He is trying to show them — and himself, too — that America can be better than this. Refugees "want the same things we want," he said. "They want a better life for their kids." Broida's rounds take him to the doors of people who have lived through hell. Such as Wissam, a 43-year-old Syrian refugee, and his wife, Dima, who arrived in February 2016 with their three children. Wissam had a job in patient relations at an American hospital in Dubai. Then the civil war came, and Wissam got his family out of Daraa, a Syrian town near the Jordanian border. They spent days in a refugee camp and three years in Jordanian exile. The family of five spent a year living in a single room while Wissam worked construction and tried to get his family to the United States. David Broida, a HIAS PA volunteer who brings household items to refugee families, right, talks with Adnan, 17, center, and his mother, Dima, about the Syrian youth’s college plans . He weeps for Daraa — "It's a catastrophe," he said. "Nothing lives there." When he arrived in New York with $14 in his pocket, he said it was like he'd been invited to heaven. Now, he works a job at the Center for Families of Children's Hospital of Philadelphia, helping overseas families arrange travel and lodging while their children are treated here. HIAS PA staffers wrote one of his recommendation letters. His daughter Rokaia, who as a toddler had crouched to the floor to avoid bullets in Daraa, is now in the fifth grade at Germantown Friends School on a scholarship. "She's very clever," Wissam said, beaming. After HIAS PA helped establish him and his family in an apartment, he bought his own home on a manicured street in Northeast Philadelphia. He tries to focus on his new life, but found it impossible to drown out the news last weekend, the idea that the agency that has done so much for him could be the target of such hatred. "It's not supposed to happen," he said. "People praying to God, and someone comes from the outside and kills them. Why? This is brutal." And with the swelling rhetoric against immigrants and refugees coming from our country's halls of power, Wissam said, he and his family fear for what could happen next. As hard as it is, he refuses to be scared. "Philadelphia is the brotherhood city," he said. "We feel safe here." On his rounds Wednesday, Broida, who is 73 and a Mel Brooks lookalike, stopped by Wissam's house with a new bicycle for Rokaia. The girl who spent two years of her life dodging bullets, "fixed to the ground," had donated her older bike, which she'd grown too big for, to another child. "I can't do this life without the help of my fellow Americans," Wissam said. Broida and Wissam shook hands. Then Broida was off on his rounds: boots and a soccer ball for an Iraqi mother of two whose husband, a taxi driver, is still missing back home. And a tablet for the family of an Afghani translator for the American military, who fled his homeland after threats that he'd be beheaded. HIAS PA is more determined than ever, said Miller-Wilson. "The work of welcome is a lot more than welcoming," she said. "At the end of the day, it becomes about preserving our shared humanity." David Broida, a HIAS PA volunteer, brings a pressure cooker to Tamim Formuli, center, and his son Ali, 7, at the Afghanistan emigres’ home in Northeast Philadelphia.